The aims of the present study were to estimate the prevalence of undetected refractive errors among primary school students in Menoufia governorate and to assess possible risk factors such as family history, prolonged near work, etc. Early detection of refractive errors in children provides the best opportunity for effective treatment, whereas failure to detect such problems early can have permanent, deleterious effects on long-term visual outcomes, educational achievement, and self-esteem. This was a cross-sectional analytical study that was carried out from the beginning of January 2015 to the end of January 2016 in children between the ages of 6 and 15 years (mean age: 8.39 ± 1.85 years). After obtaining consent from parents and the school authority, students underwent manifest refraction, vision, best-corrected visual acuity, ocular motility, and cycloplegic refraction tests. This study was conducted on 276 students (48.6% of males and 51.4% of females); 83 of them had an occult refractive error, with an estimated incidence of 30.1%. Among the studied group, 37.3% had a family history of using glasses. In addition, 28.6% of the studied group had a history of headache. The most common type of refractive errors was astigmatism (45.8%), myopia (40.4%), and hypermetropia (13.9%) among the studied group. The present study concluded that uncorrected refractive error is a common cause of visual impairment among schoolchildren in Menoufia governorate. Therefore, it is recommended that the education authority, together with the health authority, should provide appropriate measures to make eye examination for students in Egypt compulsory. Students frequently have visual problems that go undetected at the time of school entry. Suboptimal vision often leads to poor school performance with consequent lack of interest and many dropouts from school. The underlying visual problems often manifest as behavioral problems – for example, learning disabilities, dyslexia, and attention-deficit disorder. Thus, early detection of visual defects provides the best opportunity for effective treatment, whereas failure to detect such problems early can have permanent, deleterious effects on long-term visual outcomes, educational achievement, and self-esteem . Childhood blindness and refractive errors are the chief priorities of the global initiative 'Vision 2020: The Right to Sight'. Uncorrected refractive errors are the leading global cause of vision impairment and the second most common cause of blindness. Some refractive error studies, both population based and college based, conducted in some countries identified myopia as a major public health condition in various ethnic origins and cultural settings . Efficient preschool and regular-school health services can be found in the civilized world, and also the job of discovering (and managing) refractive errors lies mainly with the school health personnel along with the optometrist. Health services with the community health workers and teachers are responsible for early recognition of visual disorders in school children . The refractive errors have been associated with certain other factors as well – for example, a positive history of wearing glasses in the family, reading with materials very close to the eyes, watching computers/television sitting closely for long hours, etc. . Some studies also indicate genetic causes. However, some suspect an interplay between genetic and environmental factors as described above . The aims of the present study were to determine the prevalence of undetected refractive errors among primary school students in Menoufia governorate and to assess possible risk factors that may contribute to the occurrence of these refractive errors such as family history, prolonged near work, etc., among the same group. This study was carried out from the beginning of January 2015 to the end of January 2016. The ages of the students were between 6 and 15 years. We used a multistage random sampling technique; one district of Menoufia governorate was chosen randomly by the simple random sample, which was Shbein Elkom district. All of Shbein Elkom district's primary schools (111 primary schools) were enlisted, and three schools were randomly selected, which were Al-Rasmia Al-Motamiza School, Dar El-Trbia School, and El-Nagah School. Two hundred and seventy-six students were chosen by the simple random sampling method. The protocol was approved by the ethical committee of Menoufia University. An informed written consent was obtained from the participants. Inclusion criteria were as follows: students of both sexes from the selected schools aged 6–15 years. Exclusion criteria were students with eye glasses (26 students from all grades), students with corneal opacity (one student from all grades), cases with a history of any previous refractive surgery (not present), and cases with a history of posterior segment disorders (not present). Each participant was subjected to (i) interview and (ii) examination. Figure 1: Structured questionnaire used during data collection. Part 1 of the questionnaire assessed the socioeconomic status of the family; the questionnaire included questions about age, the father's education and occupation, the mother's education and occupation, area of residence, etc. Part 2 of the questionnaire assessed the risk factors for refractive error, including questions about near vision, TV setting, computer setting, illumination, etc. Other questions were about positive family history of wearing glasses (parents and siblings of the studied students) and questions to assess past history of any eye problem or surgery, eyelid disorders, type of disorder, eye surgery, etc. All participating students were transferred to the visiting nurse room with proper illumination, which had an illiterate Landolt broken ring chart, an autorefractometer, and a slit lamp (transferred to the schools by the researcher). The researcher illustrated to the students the steps of the examination. A 6-m distance was mapped out, and the Landolt broken ring chart was placed at one end and at the other end a seat was placed. The right eye was examined with the left eye occluded with an eye occluder. Participants were not allowed to squint, tilt their head, or close the occluded eye. They were asked to identify the direction of the broken ring on the chart from top to bottom moving across the line from left to right. If the student was unsuccessful to read a line, it was repeated in reverse order. When the line was unsuccessful read twice, visual acuity was taken as the previous line read correctly. The process was repeated with the right eye occluded. The authors performed a slit-lamp examination for every student to exclude any anterior or posterior segment disorders. Every student underwent both manifest and cycloplegic refractions using an autorefractometer. Cases with an uncorrected visual acuity score less than 6/6 were tested for their best-corrected visual acuity using a pinhole. Cycloplegia was induced with two drops of cyclopentolate 1% instilled 5 min apart. After 20 min, if a pupillary light reflex was still present, a third drop was administered. Refractive status was assessed 40–60 min after the first drop. Data collected were reviewed and were entered into a personal computer for statistical handling and analysis. Categorical variables are described using numbers and percentage intervals, whereas continues variables are described using mean and SD. χ2 Tests were used for testing the null hypothesis association between two categorical variables. Fisher's exact probability was calculated if less than five observations were encountered in any of the table cells. Student's t-test was used to check for the dissimilarity between two interval variables if parametric; if the variables were nonparametric, the Mann–Whitney U test was used. A P value of 0.05 was considered statistically significant P value less than 0.001, highly significant; P value less than 0.05, significant; and P value greater than 0.05, nonsignificant. The ages of the students ranged between 6 and 15 years (mean age: 8.39 ± 1.85 years). The study was conducted on 276 students (48.6% males and 51.4% females) [Table 1]. Eighty-three of them had an occult refractive error, with an estimated incidence of 30.1% [Figure 2] (37.3% were rural residents, whereas 62.7% were urban residents). Figure 2: Prevalence of occult refractive error among the studied group. Regarding the most common type of refractive errors, astigmatism was found in 45.8%, myopia in 40.4%, and hypermetropia in 13.9% among the studied group [Figure 3]. Figure 3: Percentage distribution of different types of refractive error among the whole studied group. We found that family history of refractive errors was significantly higher in the refractive error group compared with the normal group. In the refractive error group, it was 47.0%, whereas in the normal group it was 33.2% [Table 2]. We found no correlation between reading hours, TV hours, and computer hours on the one hand and visual acuity in both eyes on the other hand [Table 3]. In addition, there was no significant difference between the refractive error group and the normal group regarding socioeconomic status [Table 4]. The estimates of visual impairment caused by uncorrected refractive errors are of public health concern,, despite that refractive errors could be easily diagnosed and that spectacle correction is among the most cost-effective interventions in eye care. According to Baltussen et al. , screening of 5–15-year-olds yields maximum benefit, and both screening of 5–15-year-olds and of 10–15-year-olds are very economical strategies. Therefore, screening of schoolchildren is a vital measure to know the extent of refractive error and their correction at the right time. The present study showed that the prevalence of occult refractive error was 30.1%. This study is in agreement with a study carried out in Egypt by El-Bayoumy et al. , who found that the prevalence of refractive error was 22.1% in school students aged 7–14 years. Another cross-sectional analysis of 2070 healthy primary school children screened for refractive errors from 2009 through 2010 in the cities of South Sinai, Egypt, and their surrounding Bedouin settlements found that the prevalence of refractive errors was 29.4% . The result is similar to the study carried out by Prema , who conducted a study on the prevalence of refractive errors in schoolchildren in Tamil Nadu, India. This study showed that 30.57% of the students were found to have refractive errors . Kumar and Akoijam  conducted a cross-sectional study among upper-primary school students of Imphal, India, from 21 June 2014 to 8 July 2014. The sample size was calculated to be 267. The study showed that the prevalence of refractive error was 29.14% . In contrast to our study, a study by Lopes et al. in Brazil showed a high prevalence of 80.2 and 82.9% among students attending private and public schools, respectively. In Saarland Germany, Käsmann-Kellner and Ruprecht  reported a slightly lower prevalence of 69.2% among children starting primary school. On the other hand, other studies have shown a low prevalence of refractive error, such as 12.25% in Minia, Egypt , 7.1% in the Al-Marg region, eastern district of Cairo, Egypt , Malaysia 7.7% , Nepal 8.6% , Iran 3.5% , and Bangkok 12.7% . Sharma Seema et al. conducted a study on the magnitude of refractive errors among schoolchildren in a rural block of Haryana state, India. Out of the 1265 students tested, 172 (13.6%) students were found to have defective vision . This discrepancy could be due to the difference in sample size, ethnic variation, different techniques, and analysis protocol used. Refractive errors were more common in girls (51.4%) than in boys (48.6). In these studies, the differences were related to the possible differences in the rate of growth between girls and boys. Girls attain puberty earlier on average and reach their final body weight 1–2 years earlier than boys . The possible reasons for students for not wearing glasses may be a lack of awareness about refractive errors. However, some of them mentioned that it was shameful or they were shy to wear eye glasses, especially girls. In this study, the mean age of children with refractive error was 8.44 years, which is in agreement with a Saudi study  with a mean age of 9.4 years and also an Egyptian study by El-Bayoumy et al. with a mean age of 9.6 years. This study showed that most of the children were from an urban area, representing 62.7% of the sample. This study is in accordance with other studies where a higher prevalence of refractive error has been documented in the urban population ,,. Higher prevalence of refractive errors in urban areas could be associated with the higher use and abundance of personal computer systems and electronic devices because of advanced socioeconomic transition combined with the availability and regularity of electrical energy that has motivated young children to remain inside and be involved with activities that cause far more eye strain. The present study showed no significant statistical difference between children with refractive error and normal children regarding sitting in front of the TV, the distance between the computer and user, illumination, white illumination, and less than 2 h in setting, which is in contrast with another study by Ali et al. in Pakistan, which showed that there is evidence in the literature of a strong relationship between short-distance TV watching and development of refractive errors. This may be because, in our questionnaire, we considered close distance at 1.5 m and may be the other authors considered a closer distance. This is why it needs further explanation in the future using a wider range of population. Some studies have reported that a higher level of near work is associated with a higher prevalence and progression of myopia . In this study, there was no significant statistical difference between children with refractive error and normal children regarding the history of eyelid disorders involving chalazion. The present study is in agreement with another study with respect to mean preoperative corrected visual acuity, which was near 6/6, and it did not change postoperatively . The present study showed an insignificant statistical difference between children with refractive errors and normal children regarding positive family history – 77 students out of 116 had a positive family history. This result is in disagreement with a Pakistani study  showing that 61 out of 107 students who had refractive errors had a positive familial history of using glasses, and this indicates a strong relationship between refractive errors and heredity or familial factor. The present study showed insignificant statistical differences between children with refractive errors and normal children regarding socioeconomic status. The present study is in disagreement with another study by Ali et al. , who showed that there is a strong relationship between refractive error and socioeconomic standard. This relationship is not a direct factor but an intermediate factor attributed to changing 'environmental conditions' and having higher education, near work-related occupations involving computers, etc., and higher family income. In conclusion, the prevalence of occult refractive errors in children in this study was 30.1%. Given the observation that refractive errors were common and high in this study, there is a need for the Ministry of Health in collaboration with the Ministry of Education in Egypt to be involved in health education to increase awareness of refractive errors in children, to identify risk factors, and provide readily available and affordable eye care services in the local communities. Yamamah GA, Talaat Abdel Alim AA, Mostafa YS, Ahmed RA, Mahmoud AM. Prevalence of visual impairment and refractive errors in children of South Sinai, Egypt. Ophthalmic Epidemiol 2015; 22:246–252. Paudel P, Ramson P, Naduvilath T, Wilson D, Phuong HT, Ho SM, et al. Prevalence of vision impairment and refractive error in school children in Ba Ria – Vung Tau province, Vietnam. Clin Exp Ophthalmol 2014; 42:217–226. Joseph N, Nelliyanil M, Rekha T, Rai S, Kotian SM. Proportion of refractive error and its associated factors among high school students in South India. Br J Med Med Res 2015; 11:1–9. Pokharel A, Pokharel P, Das H, Adhikari S. The patterns of refractive errors among the school children of rural and urban settings in Nepal. Nepal J Ophthalmol 2010; 2:114–120. Fan Q, Wojciechowski R, Ikram MK, Cheng C-Y, Chen P, Zhou X, et al. Education influences the association between genetic variants and refractive error: a meta-analysis of five Singapore studies. Hum Mol Genet 2014; 23:546–554. Resnikoff S, Pascolini D, Mariotti SP, Pokharel GP. Global magnitude of visual impairment caused by uncorrected refractive errors in 2004. Bull World Health Organ 2008; 86:63–70. Holden BA, Fricke TR, Ho SM, Wong R, Schlenther G, Cronje S, et al. Global vision impairment due to uncorrected presbyopia. Arch Ophthalmol 2008; 126:1731–1739. Fotouhi A, Hashemi H, Khabazkhoob M, Mohammad K. The prevalence of refractive errors among schoolchildren in Dezful, Iran. Br J Ophthalmol 2007; 91:287–292. Baltussen R, Naus J, Limburg H. Cost-effectiveness of screening and correcting refractive errors in school children in Africa, Asia, America and Europe. Health Policy 2009; 89:201–215. El Bayoumy B, Saad A, Choudhury A. 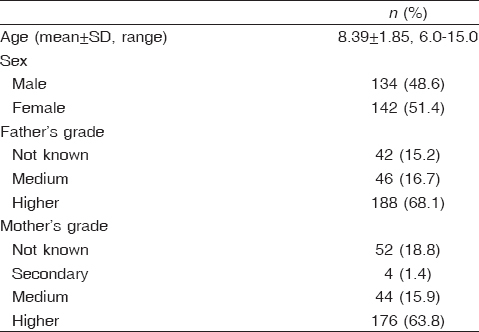 Prevalence of refractive error and low vision among schoolchildren in Cairo. East Mediterr Health J 2007; 13: 575–579. Prema N. Prevalence of refractive error in school children. Indian J Sci Technol 2011; 4:1160–1161. Kumar KS, Akoijam BS. Prevalence of refractive error among school-going children of Imphal, Manipur. Int J Med Sci Public Health 2016; 5:1364–1368. Lopes GJA, Casella AMB, Chuí CA. Reduced visual acuity prevalence in first grade school children of elementary state public and private schools of Londrina-PR, Brazil 2000. Arq Bras Oftalmol 2002; 65:659–664. Käsmann-Kellner B, Ruprecht KW. Vision screening survey of all children starting primary school in 1998 in the Federal State of Saarland, Germany. Strabismus 2000; 8:201–207. Abdelrazik S, Khalil M. Prevalence of amblyopia among children attending primary schools during the amblyogenic period in Minia county. J Egypt Ophthalmol Soc 2014; 107:220–225. El-Moselhy EA, Abo-Seif HS, Allah ESA, Ghandor AA. Prevalence, risk assessment and impacts of eye diseases among school children in Cairo, Egypt. J Am Sci 2011; 7:235–246. Hashim S-E, Tan H-K, Wan-Hazabbah W, Ibrahim M. Prevalence of refractive error in malay primary school children in suburban area of Kota Bharu, Kelantan, Malaysia. Ann Acad Med Singapore 2008; 37:940–946. Yingyong P. Refractive errors survey in primary school children (6-12 year old) in 2 provinces: Bangkok and Nakhonpathom (one year result). J Med Assoc Thai 2010; 93:1205–1210. Seema S, Vashisht B, Meenakshi K, Manish G. Magnitude of refractive errors among school children in a rural block of Haryana. Internet J Epidemiol 2009; 6:1540–2614. Biro FM, Galvez MP, Greenspan LC, Succop PA, Vangeepuram N, Pinney SM, et al. Pubertal assessment method and baseline characteristics in a mixed longitudinal study of girls. Pediatrics 2010; 126:e583–e590. Al Wadaani FA, Amin TT, Ali A, Khan AR. Prevalence and pattern of refractive errors among primary school children in Al Hassa, Saudi Arabia. Global J Health Sci 2013; 5:125. Fotouhi A, Hashemi H, Khabazkhoob M, Mohammad K. The prevalence of refractive errors among schoolchildren in Dezful, Iran. Br J Ophthalmol 2006; 91:287–292. Khandekar R, Dharmadhikari S, Dole K, Gogate P, Deshpande M, Padhye A. Prevalence of uncorrected refractive error and other eye problems among urban and rural school children. Middle East Afr J Ophthalmol 2009; 16:69. Ali A, Ahamad I, Ayub S. Prevalence of undetected refractive errors among school children. Biomedica 2007; 23:96–101. Jones LA, Sinnott LT, Mutti DO, Mitchell GL, Moeschberger ML, Zadnik K. Parental history of myopia, sports and outdoor activities, and future myopia. Invest Ophthalmol Vis Sci 2007; 48:3524–3532. Sabermoghaddam AA, Zarei-Ghanavati S, Abrishami M. Effects of chalazion excision on ocular aberrations. Cornea. 2013; 32:757–760.